Mercury transits the sun, as seen by the NASA/ESA SOHO spacecraft in 2006. 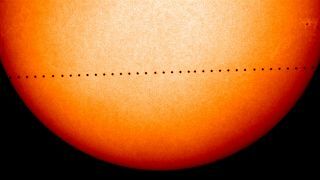 Mercury will transit the sun again on May 9, 2016. This month offers skywatchers two very interesting planetary sights that have not been seen from Earth in at least a decade. Remember that when you're measuring the angular separation between two celestial objects, your clenched fist held at arm's length measures roughly 10 degrees. Below is a schedule that provides some of the best planet viewing times, and instructions for where to look to see these planets. May 1: Venus is currently lost from view, hopelessly mired deep in the dawn, very low near the sun, unless you live around 35 degrees south latitude (Cape Town, South Africa; Sydney; Montevideo, Uruguay). Even there, the more favorable tilt of the dawn ecliptic places Venus no more than 5 or 10 degrees above the east-northeast horizon a few minutes before sunrise during the first half of May. May 14: As the sky darkens this evening, take note of the brilliant silvery "star" shining with a steady glow about 3.5 degrees to the upper left of the moon; in reality, it's the planet Jupiter. Jupiter sits far apart from the other planets in the evening sky, high in the south-southwest at dusk. Currently, it's shining at an eye-popping magnitude of minus 2.2 and is the brightest visible planet, though at this particular moment, it's only just 0.3 magnitude brighter than Mars. That will change in the coming days as Mars continues to draw closer to Earth. Jupiter will have halted its retrograde (westward) motion against the stars when it reaches a point about 12 degrees southeast of Leo's brightest star, Regulus, on May 9. May 21: As the full moon rises this evening above the southeast horizon, you can't help but take note of Mars, now one night from opposition (when Earth is between Mars and the sun). The planet will be shining brilliantly about 6 degrees to the right and a bit lower than the moon. May 22: Mars comes to opposition tonight, rising at sunset, crossing the meridian in the middle of the night and setting at sunrise. It blazes at magnitude minus 2.1 and finally matches Jupiter in brilliance, as well as outshines everything else in the night sky except the moon. Now situated in the zodiacal constellation of Scorpius (the Scorpion), it's positioned about 9 degrees to the upper right of its "rival," the ruddy first-magnitude star Antares. The star certainly is closer to a true red color than to the fiery orange-yellow glow of Mars, but Mars outshines Antares by a full three magnitudes, which means it currently appears nearly 16 times brighter than the star. Also, watch for the rising of the moon this evening in the east-southeast sky, and you'll notice a very bright, yellowish "star" situated 3 degrees to its right. That will be Saturn. Shining at zero magnitude and appearing nearly as bright as the giant, red star Arcturus, Saturn is quite a spectacle when viewed through a telescope! The glorious ring system is about as close to face-on as it ever can get, tilted toward us by 26.1 degrees. May 30: At 5:35 p.m. EDT (2135 GMT), Mars will come closest to Earth for this current apparition, at a distance of 46.8 million miles (75.3 million kilometers). In a telescope, it displays a disc about 0.0051 degrees across (18.6 arc seconds), meaning it appears larger than it has since 2005. A 4-inch (10 centimeters) telescope magnifying at 100 power will provide a good view of the disc of Mars. It is late summer in the Martian northern hemisphere, geometrically equivalent to mid-August here on Earth, so the remnant north polar cap will probably not be visible in small and even moderate-size amateur telescopes. Joe Rao serves as an instructor and guest lecturer at New York's Hayden Planetarium. He writes about astronomy for Natural History magazine, the Farmer's Almanac and other publications, and he is also an on-camera meteorologist for News 12 Westchester, New York.